Whether you're planning a road trip to Utah in the near future, or simply dreaming of visiting someday, I'm stoked for you! Utah is unbelievably beautiful, and one of the most unique places in the U.S. On a 1-week road trip from Seattle to Utah, you can see easily see three of Utah's five national parks without feeling too rushed. Not to say 1 week is ever enough time, but by following the itinerary below, you'll get a good taste of Utah and see why so many people are drawn back there. Morning: Get up bright and early and hit the road! Your Utah road trip has officially begun. Afternoon: Stop in Pendleton and stretch your legs. If you time it right, you can tour the mill where Pendleton’s wool products are made. Evening: Set up camp in Twin Falls, Idaho. If you’re not too exhausted from driving, check out Shoshone Falls. Morning: Stop in Salt Lake City, Utah on the way to Moab. You can grab delicious baked goods from The Rose Establishment and check out Temple Square for a taste of Mormon culture. Afternoon: Arrive in Moab and set up your campsite. If you arrive in the midst of summer, you might want to hang out in air conditioned souvenir shops and cafes until the sun gets a little lower in the sky. Evening: Get back in the car and see a sneak peak of Arches National Park. This park only has one main entrance and one main road, so navigating is super easy! The ranger will give you a free map when you enter, and you can use it to pick out which places you want to stop at. Morning: Wake up early and hike to Delicate Arch before the sun rises. You’ll get incredible views, and won't have to share them with too many other people. Afternoon: Explore any last arches or viewpoints you’d like to see. 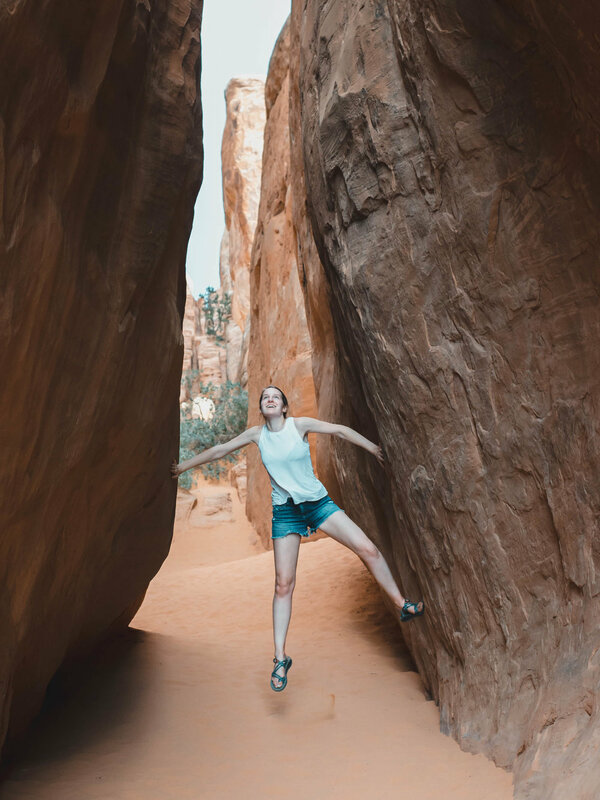 If you’re still up for a little hiking, Landscape Arch is a favorite among visitors, and the longest natural arch in the world! Evening: Drive closer to Bryce Canyon and sleep there for the night. My friends and I stayed in a tipi just 25 minutes away from the Bryce Canyon park entrance, and had the best time! You can read more about our experience here. Morning: Pick a few trails to conquer and start exploring! During our visit, my friends and I started our day with the Navajo Loop Trail and the Rim Trail section between Sunset Point and Sunrise Point. Afternoon: Give your legs a break and drive to Rainbow Point, the highest point of Bryce Canyon National Park. Next, check out the waterfall on the Mossy Cave Trail. Evening: Spend another night at the tipi site and enjoy the beautiful view you have of the stars. Try and go to bed early so you can get to Zion by 6 am (beating the crowds will be worth it). Morning: Get an early start and drive from Bryce Canyon to Zion National Park. Start hiking as soon as you arrive! There’s less people hiking the trails in the morning, and the temperature will be cooler. Not sure which hike to go on? Read about my experience hiking to Observation Point. Afternoon: Finish up your morning hike and check out another area of the park if you still have time and energy. If you decide to leave the park after your first hike, a great place to grab some made-to-order sandwiches is Hoodoos General Store. Evening: Make your way to Hildale, Utah and experience glamping. The glamping site we stayed at was located right next to natural spring, and had a queen-sized bed inside the tent. Morning: Stop at the River Rock Roastery Company in La Verkin. This cafe serves up the best food, and has patio seating overlooking a canyon. Food wise, I can attest to their quiches, smoothies (made with fresh fruit and no added sugar), and giant cinnamon rolls. Afternoon: Drive, drive, drive. The sooner you get to Lake Tahoe, the sooner you can jump in the lake! Make sure and get gas often though along the way. Nevada has long stretches of nothingness, and is the last place you want to break down. Evening: Enjoy your evening at beautiful, Lake Tahoe - you’ve earned it! Morning: Say goodbye to Lake Tahoe. You’re headed for Crater Lake! Afternoon: Fill up on gas and anything else you might need in Klamath Falls. There aren’t any gas stations in Crater Lake National Park. After you set up camp, explore one of the many hiking trails near Crater Lake, or drive the 33-mile scenic loop around Crater Lake’s edge. Evening: Enjoy your last night of camping. Tomorrow you’re sleeping in a your own bed. Morning: Explore Toketee Falls in the nearby Umpqua National Forest. The trail is only 0.8 miles, and leads you to one of Oregon’s most iconic waterfalls. Afternoon: Grab lunch in Portland. My favorite spot is Teote House Cafe. They serve up flavorful, Venezuelan food and have a killer rooftop patio. Evening: You’re home! Give yourself a break from driving and sort through the millions of pictures you took. How close was this to my actual Utah road trip itinerary? You could say we were ready to be home haha. That being said, had things gone more smoothly at the end of our trip, I would’ve loved to stay at Crater Lake, and seen Toketee Falls. Unfortunately Lake Tahoe was not a part of our actual itinerary, but only because we waited too long to book our campsite. Book your campsites as far in advance as possible. If you’re cutting it close, KOA campgrounds tend to have last minute openings, and there are usually some available listings on Hipcamp. Never used hipcamp before? Use this link to create your account, and get $20 off your first stay. Take your car to a mechanic before you leave and have them run a trip check. They’ll look over your car’s fluids, belts, hoses, etc. Buy a National Park Annual Pass. It'll save you money in the long run and is good for an entire year at any national park in the U.S. Learn more here. Planning a Road trip to utah?